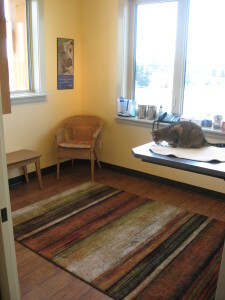 At Eastern Slopes Veterinary Services we provide 20 minute appointments to complete a thorough physical exam on your pet. If you have any concerns with your pet please mention this at the time of booking the appointment so we can be sure that we allot enough time for our doctors to address the issues. In today’s’ society our animals are subjected to a variety of different situations, from daily visits to the doggy daycare, frequent visits to hospitals or children’s groups, romps in the off leash parks and our little fur babies that never leave the home. Because of this diversity we believe that vaccine requirements and parasite control should be tailored to the lifestyle your pet leads. Dental health is one of the most important aspects of the overall health of your animal. 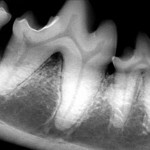 With regular annual exams we are able to monitor the dental health of your animal. 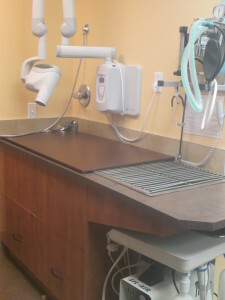 If it becomes evident that your pet may require some attention to address dental disease, whether it is a routine teeth cleaning to multiple extractions, we are fully equipped to provide the service that your pet requires. 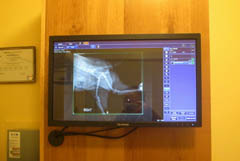 X-rays are a great diagnostic tool and at Eastern Slopes we are happy to provide this to our patients. 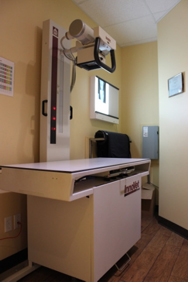 Just down the hall from our exam rooms is our radiology area where we are able to take digital x-rays and view images instantly . 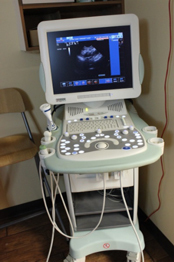 Ultrasound is also a great source of diagnostic imaging. We use ultrasound to supplement information gleaned from radiographs and often it is used to get a wonderful visual inside the animal in a very non-invasive manner. From cardiac to abdominal scans, ultrasound is a very useful diagnostic tool that is used frequently! For example, we use ultrasound to safely obtain a sterile urine sample, to diagnose bladder stones, to diagnose tumors or other abnormalities. 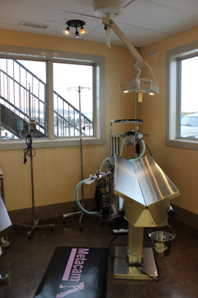 The surgical suite at Eastern Slopes boasts a bright spacious work area with all the tools necessary to provide high quality surgical procedures to our patients. 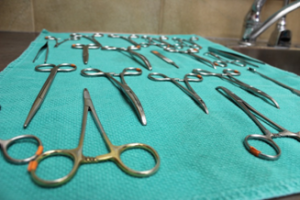 We offer elective surgeries such as cat spay &neuters and dog spay & neuters as well as some orthopedic surgeries, abdominal surgeries and let’s not forget about the cesarean sections! 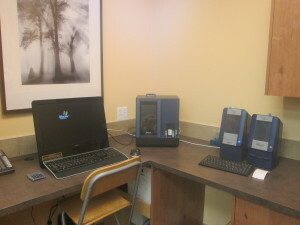 The clinic is equipped with a full in-house laboratory which is used to run complete blood profiles, urinalysis, fecals and cytology. 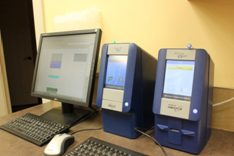 We are able to collect our samples, run the tests required and provide results in a short amount of time. This service is very valuable in providing a diagnosis when time is of the essence. In today’s animal world there seems to be a variety of different specialized foods available, boasting a wide variety of ingredients that will address any possible dietary need. This can become overwhelming to owners but rest assured the staff at eastern slopes is educated in the field of animal nutrition and would be more than happy to answer any questions you might have regarding your pet’s diet. The clinic has many specialized diets available as well as regular maintenance veterinary approved diets. 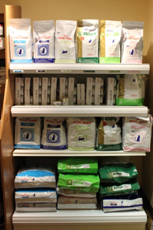 All of the food that we carry is 100% guaranteed so if your pet has a picky pallet you are able to return it to the clinic for a full refund! The most common form of animal Identification is a collar fitted with a tag that includes a current contact number along with your pet’s name. This works well if your pet wears his or her collar at all times! In some cases our little furry friends happen to slip out of their collars or don’t happen to be wearing them at the time they make a break through the back yard gate! 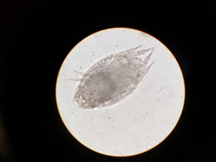 Other forms of animal identification that are very effective are tattoos and microchips. Eastern Slopes offers both of these services to our patients. Tattoos are placed inside the right ear and are done while the animal is under anesthesia, the most convenient time to do this is when the pet is spayed or neutered. However, we are able to do it at anytime using an anesthetic, which would require your pet to spend a few hours at Eastern Slopes. Microchips are also available and are easily inserted under the skin between the shoulder blades of your pet. It is a quick procedure that can be done during a regular office visit. These forms of animal identification have proven to be invaluable in the recovery of many lost pets. 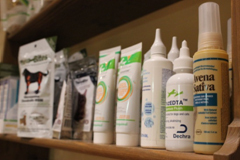 Our retail area is stocked with a multitude of products that are specific to the health of your furry friends. 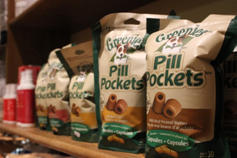 From joint supplements to treats formulated to help with dental health. Let’s not forget about the squeaky toys that might be a special treat for a well behaved pet during his or her visit with the doctor!